That's all for the day and for this week - thank you for joining us. To keep up with what's happening over the weekend, head to BBC Tees, BBC Newcastle, Look North, and online. You can tweet your photos to @BBCNewsNE, email them, or contact us via our Facebook page. Our coverage today has been dominated by the funeral of Bradley Lowery. We'll leave you with this video of his school friends celebrating his life. Mainly dry through this evening with some bright spells. Cloud will increase overnight with periods of rain or drizzle on the Pennine hills. Eastern areas should remain largely dry, while southwesterly winds will freshen. Vera star Brenda Blethyn has received an honorary degree from Sunderland University. The award-winning actress has starred in a number of films including Secrets and Lies, Little Voice and Atonement and on television Vera, which is filmed in the North East. She received an Honorary Doctorate of Arts in recognition of her outstanding acting career in film, television and the theatre. Durham Police have welcomed their new puppies on Twitter. Smithy and Wilson are eight-weeks-old and will soon be trained up to be part of the team. Three officers from Northumbria Police won the top prize at the Police Bravery Awards for disarming a mentally ill gunmen during a struggle at a Gateshead pub which saw the weapon fired. Constables Sarah Currie, Michael Otterson and Sergeant Elliot Richardson ended up in a violent and lengthy struggle with the man as they tried to stop him aiming the gun at them but he managed to fire a shot into the ceiling. When his bag was searched they found two handguns, a crossbow, a pack of throwing knives, home-made petrol bombs, smoke grenades and a baseball bat inside. The officers have been praised by the Home Secretary Amber Rudd. Chief Constable Steve Ashman said: “I am very proud of each of the officers for the outstanding bravery they have shown." And if you want to look into it further, take a look at the Get Inspired guide. Durham's police and crime commissioner has been hosting an international event in the city, in which a call will be made for Britain's drugs policy to move away from criminalisation and towards healthcare and recovery. Ron Hogg (pictured) welcomed speakers from around the world to talk about subjects including policing, health and politics. Two years ago Durham Police said they would no longer target those who grow small amounts of cannabis for personal use. Meanwhile the government's publishing a new approach to tackling drugs, but decriminalisation is off the agenda. 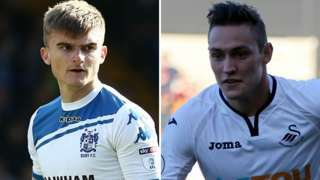 Swansea City loan defender Connor Roberts to Middlesbrough, who also sign Bury's George Miller on a permanent deal. Ministers have refused to promise funding for the £435m needed for a new fleet of trains for the creaking Tyne and Wear Metro. Six-year-old Sunderland fan Bradley Lowery has been laid to rest today. Throughout his life, Bradley had many memorable moments, after capturing people's hearts. They included last Christmas, when he received thousands of cards from across the world. Bradley's headteacher remembers the last time she saw the little boy. Many attended a vigil in memory of Bradley Lowery at Monument in Newcastle. A number of those who attended wore football shirts to honour the six-year-old. Hundreds of tributes for Bradley Lowery have been left outside Sunderland's Stadium of Light. The six-year-old was a fan of the club, and was made a mascot last year. Football shirts, flowers and balloons are among the tributes left by mourners. Pupils and teachers at Bradley Lowery's school have released balloons in his honour. Former Sunderland manager David Moyes was among the thousands who attended Bradley Lowery's funeral earlier. Bradley was a well-known Sunderland fan and appeared as a club mascot a number of times. People have donned football shirts of all colours to show their respects for Bradley Lowery outside the Stadium of Light. The front of the order of service from this morning's service shows Bradley in his Sunderland kit and as a baby. 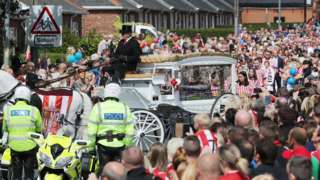 'A real brave superhero' - thousands say goodbye as Bradley Lowery is laid to rest. 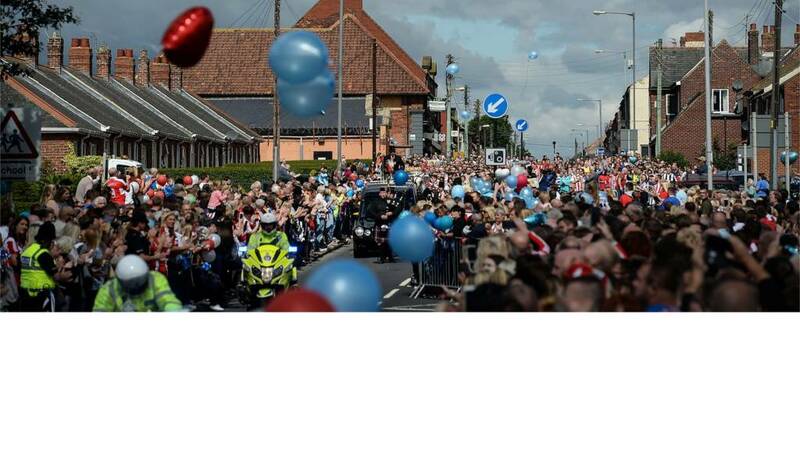 Footballer Jermain Defoe is among the funeral cortege as it brings Bradley's home town to a standstill.